Famous people born on JULY 16 will succeed at what they set out to accomplish. They think about their future and set out a plan to make it happen. Additionally, having an inside look at their future, they are optimistic at the possibilities. They say that imagining, acting and believing in a manner that they have already accomplished their goals will possibly aid in obtaining everything they want. 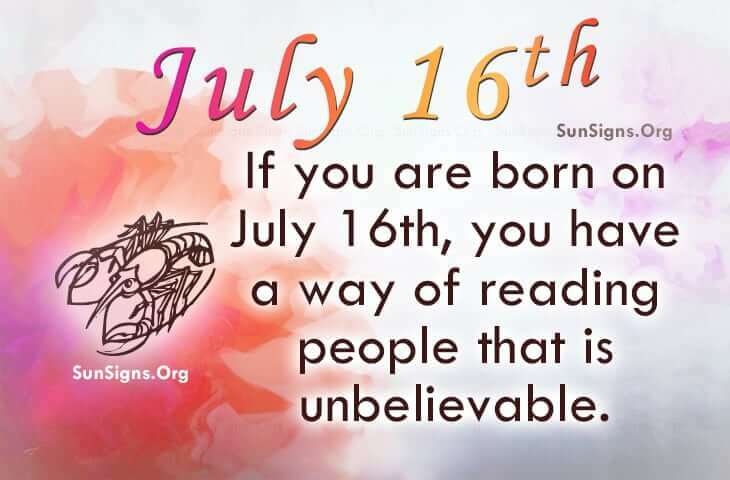 As a gift, famous people born on July 16 know what people are thinking and feeling a lot of times before they even say it. When looking for a lover, they are actually looking for a mirror like image. It could be someone who is fun loving, generous and pleasant to be around. Oh and, someone has the ability to see both sides of an argument. The career choice that could be best for the famous celebrities of July 16 is one that allows them to help other people. Famous celebrities born on July 16th are typically mysterious people. They have a way of reading people that is unbelievable. This intuitive quality allows them the ability to choose their soul mate with confidence.